Enjoy our busy little town with its many shops, delve into the history of phonotechnology, the clock industry and rural life. Take a break and pay us a visit. The history of this farmhouse dates back to 1664. It is located in the town center and was destroyed by a fire in 1802 and rebuilt in 1803. At the beginning of the nineties it was restored with great engagement and became the local museum of history and culture. 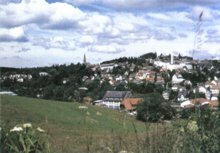 It illustrates the homes, the life and the work of the Black Forest people in former days. A unique museum of its king in Germany, which is situated in the town hall of St. Georgen since its opening in 1972. The phonographic exhibits illustrate the historical development of phonographic technology, including its many curiosities in a nearly complete order. The collection begins with a phonograph invented by Thomas Alva Edison in 1877. 10 years later the gramophone was invented by Emil Berliner launching a 100-year lasting success of the phonographic record. The restored farm mill of the Kobisenhof, located in the Hippengehr in Oberkirnach, dates back to the 15th century and has been classified as a historical monument. The farm mill gives a very realistic insight into the functioning of a Black Forest mill with two millworks. The Black Forest railway is a 149 km track connecting Offenburg to Singen. The most interesting section between Hornberg – Triberg – St. Georgen lies in the center of our Holiday region and is today still regarded as an engineering masterpiece. With an altitude difference of 670 meters (2200 feet) and a maximum gradient of 20%, the line having 39 tunnels is one of the most tunneled railways in the world and has become and example for other mountain railways. Romantic journeys passing through the many tunnels are an unforgettable experience.